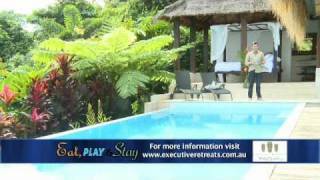 Executive Retreats offer a selection of award winning architecturally designed holiday retreats in the Port Douglas area, Tropical North Queensland. Choose between trendy holiday homes and Balinese inspired beach villas on absolute beach front, luxury lifestyle and spa retreats on secluded, private acreages and chic apartments and townhouses in the heart of cosmopolitan Port Douglas. An Executive Retreat is essential for your next escape to paradise! Indulge and succumb to a qualified massage therapist as they unravel your stresses...or let five star chefs tantalise your taste buds with exotic culinary delights. All this can be arranged in the privacy of your Executive Retreat. Charter a boat to the reef or perhaps a helicopter to a spectacular rainforest setting. Indulge in the 'Art of Tropical Living' at Shangri-La, the ultimate in rainforest escapes. If you are looking to seriously escape to a safe haven then this is your Shangri-La with the majestic Daintree Mountains as your vista. This home appeals due to it's very special ambience and solitude. It becomes your own sanctuary. Luxurious and spacious, a relaxing and unforgettable holiday for a family, friends or honeymooners to hideaway. A holistic retreat to rekindle the soul. Shangri-La is a stone walled, French provincial design and accommodates eight guests in an intimate atmosphere. Positioned on 30 very secluded acres, enjoy rediscovering the simple pleasures of life. Soak up the sunshine on the decks of the heated 20-metre infinity pool and gaze out at the glorious views of the Daintree Mountains. Choose one of the four interior bedrooms or sleep out with the stars in the poolside cabana. Complete with it's own Vichy Spa, Shangri-La is a destination for rest and relaxation. Breathing in the purest mountain air, exploring lush rainforest, swimming in the mountain streams, all you need to restore balance and harmony. Quite simply, this is a hidden tropical paradise.